Just a 5 minute drive from the M4 and 1.5 miles from Port Talbot town centre. Great base for visiting the local attractions including Aberavon beach, Swansea Bay and the Gower Peninsula. 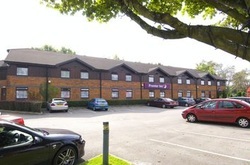 This Premier Inn offers free on-site parking and has a Beefeater Grill restaurant serving good value fresh meals throughout the day. Book direct for the best Premier Inn Port Talbot deals.